Paintings in the size of 55x28 inches are made for the space above your living room sofa or above the chest of drawers in your living room. It would be wise to avoid putting a landscape piece and tall furniture together, since this combination tends to make the room appear uncomfortably small. Thus, have a careful thought of where you would like to put your handmade acrylic paintings. And do the same when you are choosing the motif in your canvas paintings! In an office you can impress your clients with the virtuoso brushworks in abstract paintings, whereas adorable animals painted on canvas will certainly bring endless joy to your children. Motifs like a fluffy bear can easily fill the children’s room with playfulness and gaiety. Generous size = plenty of joy! hand-painted roses bloom in their full splendour, symbolising eternal love and passion. a stunning skyline casts its magic in glistening hues of silver. the warm colours of summer will raise our spirits anytime, anywhere. Working with real passion and great pleasure, the experts at KunstLoft are devoted to building a motif selection that both reacts to the newest trends and pays homage to timeless classic styles. 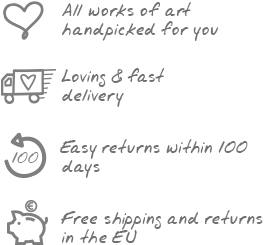 We are proud to offer a suitable piece of artwork for everyone – and should you be unlucky with your search, we also offer the option of customised painting. Day in, day out, we hurry from this meeting to that appointment and simply bypass the beautiful things in life. A large canvas painting with the dimensions 55x28 inches serves as a real eye-catcher in your doctor’s office or living room that will keep anyone standing for a moment just to admire its beauty. Apart from handmade oil painting, you can add beauty to your living and working spaces with our new sculptures, which complement our canvas paintings perfectly. No one should be confined to choosing one type of art – instead, a combination of paintings and sculptures from different materials is the proper way to go! Paintings in the size 55x28inch unfold their effect in large rooms. The handmade acrylic paintings impress with their format and the attention to detail that goes into every brushstroke. The horizontal works of art will amaze your visitors in your office and stimulate their thoughts.